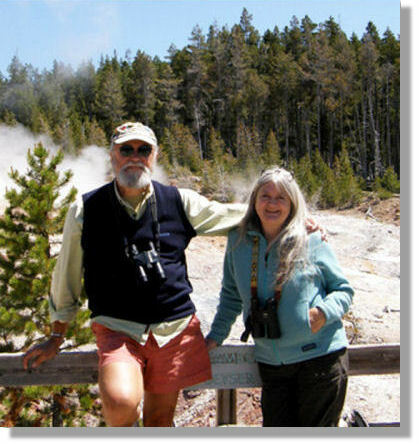 at Yellowstone National Park, July 2009. "Call for Entry" $3000 in prizes! 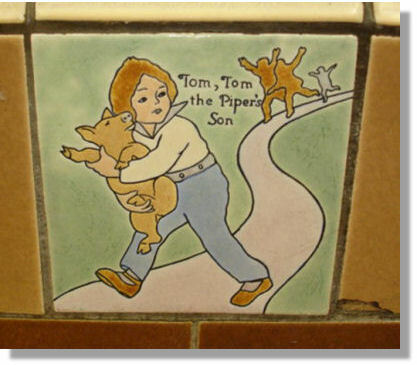 “Tell-Tale Tiles & Fractured Fantasies” explores contemporary tile making and ceramic mosaic as a story-telling medium in the spirit of artists Henry Chapman Mercer and Isaiah Zagar. The scope of the exhibition will be broadened to include social, political, personal and family stories. 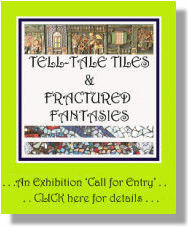 The exhibition is co-presented by Philadelphia’s Magic Gardens and the Tile Heritage Foundation. The exhibition will be held at Philadelphia’s Magic Gardens, 1020-1026 South Street, Isaiah Zagar’s enormous mosaic labyrinth. The venue will provide a space for tile and mosaic artists from around the country and abroad to make powerful statements in their medium that are socially meaningful to both themselves and the community. Exhibition dates: March 19th – April 19th 2010. Application deadline: December 1, 2009. Imagine yourself a congressperson in Washington being presented with a proposal to designate as a national park a reportedly inhospitable territory, 55 x 65 miles in size, site unseen! Yet in 1871, based simply on a series of black and white photographs, some beautiful paintings by artist Thomas Moran, and a 500-page report submitted by expedition-leader Ferdinand Hayden, Congress passed a bill creating Yellowstone, the nation’s first national park, which was then signed into law by President Grant. on soda fountains in the late 1920s. Of course, we were there to experience the natural marvels of the place: the geysers, prismatic hot springs, mud pots and fumaroles, the deep canyons and gorgeous waterfalls, and the ample wildlife. Tiles were the furthest things from our minds! That is… until we walked into Eagle’s. No, not the birds! Detail of the decorative tiles with rounded edges. For over 100 years Eagle’s, a curio and outfitters store in West Yellowstone, Montana has served the ever-growing numbers of tourists and the local community as well. The major draw for both groups over the years has been the soda fountain with its swiveling stools and delicious ice cream, malts, coffee, etc. 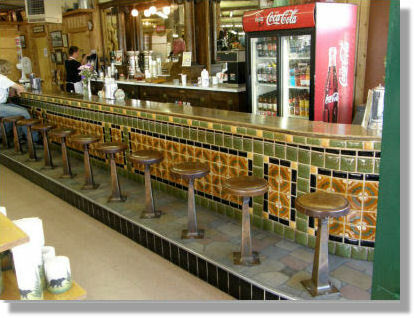 But the draw for us were the strikingly attractive pillow tiles decorating the front of the counter! Fred Willson, and this structure was expanded in 1927, which may well be when the pillow tiles were installed. But then there was a massive earthquake that rocked the town in 1958. Could the counter have withstood its impact? 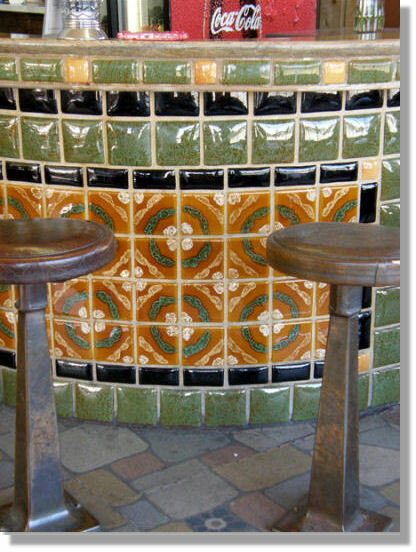 From about 1923 into the mid-1930s pillow tiles were made by a number of different Southern California tile companies: Malibu Potteries (1926-1932) is the prime candidate, or perhaps California Clay Products—CALCO (1923-1932), but Tudor Potteries (1927-1931) and Haldeman Tile Manufacturing (1928-1930) are also possibilities. Can you help? 16 ½ x 24 ¾ x 1 3/8. architect Robert Reamer, who also designed the Old Faithful Inn. 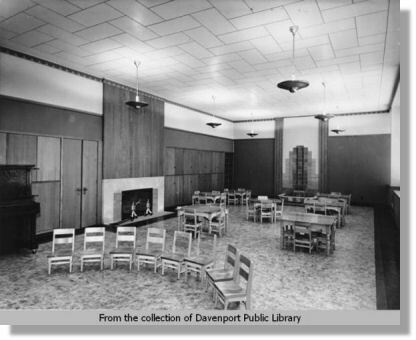 And it was in 1923 when the lobby received its pièce de résistance: an impressive Batchelder fireplace mantel and a Batchelder wall-mounted drinking fountain adjacent to it. Talk about feeling “at home”! just to the right of the mantel. 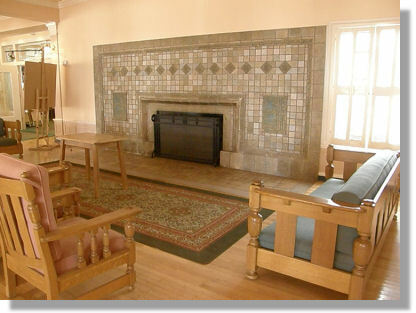 The hostess, an older woman, who reserved a table for our luncheon, reported that she understood that the tiles around the lobby fireplace were made in Ohio. She held her ground when we declared they assuredly were made in California. After lunch we approached the front desk where a clerk, in response to our questions, pulled out a sheet of hotel-related history and asserted that the tiles were Rookwood! Was this an Ohio conspiracy? As it turned out, behind the desk in a less obvious location, a loose-leaf folder appeared with all kinds of current and accurate information about the Batchelder tiles and their maker, Ernest Batchelder. Someone out there had done a wonderful job compiling this information, providing the hotel with a presentation folder as well. Kudos to the mystery person! 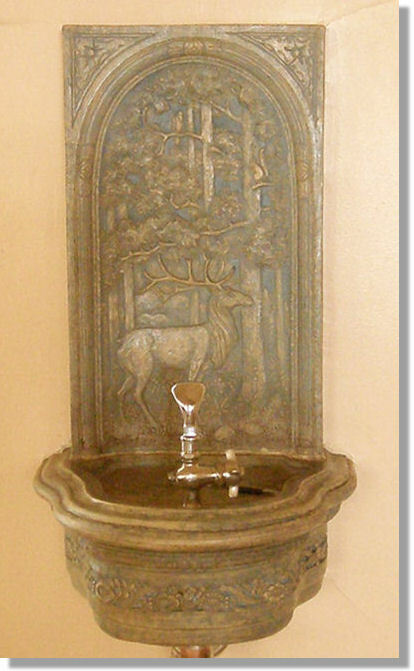 by Franklin Tile Company, 1939.
and the frog fountainhead in the center. Franklin nursery rhyme insert No. 455. 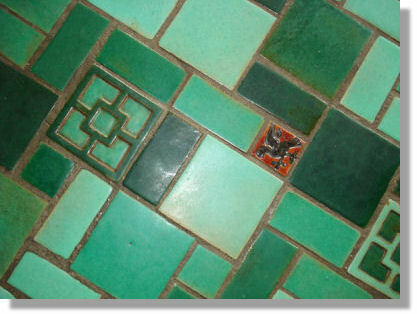 Increasingly, most likely the result of our web presence, Tile Heritage is being contacted by people throughout the United States who want to have their tiles identified. We don’t charge for our services. And in the event that we don’t know or can’t be certain of an attribution, we forward the images to others who may be better able to assist. Franklin nursery rhyme insert No. 457. 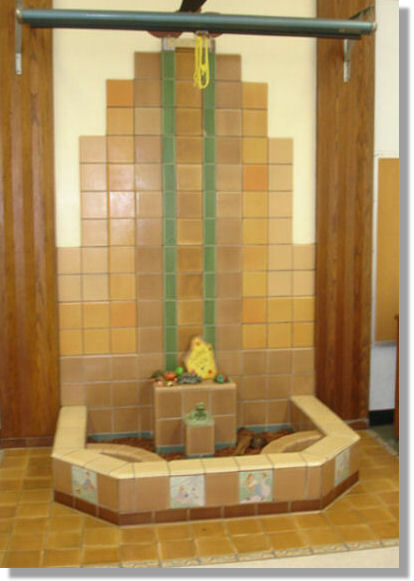 The tiles at Monroe Elementary were made by the Franklin Tile Company in Lansdale, Pennsylvania, north of Philadelphia. The company was founded in 1923 by two brothers, Malcolm and Roy Schweiker, who remained with the company until their retirement some 50 years later. Although the Lansdale plant is now closed, the company through a series of mergers became American Olean, at one time the largest manufacturer of tiles in the U.S. AO is owned by Dal-Tile today. 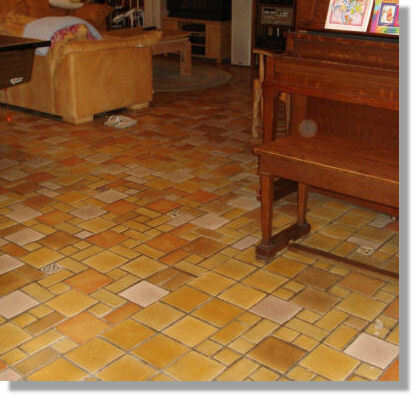 The tiles are illustrated in Franklin's 1936 catalog, a reproduction of which is available at http://www.tileheritage.org/THF%20Catalogs-Page 3.html. Franklin nursery rhyme insert No. 458. Most importantly, we want Cindy to know how appreciative we are that she and others before her have maintained this installation so well. This is a significant piece of American decorative art, ideally suited for a kindergarten classroom. We are thrilled to know about it! All photos courtesy Cindy Schollaert. Monroe Elementary School is located at 1926 West Fourth Street in Davenport. I am attaching a picture of what the classroom looked like in 1940. You can get a feel for what a beautiful space it is. Thanks so much for your help with the research on the fountain. I measured the base of the frog fountain, and the pedestal. It appears to be about 6-1/2 inches. I don’t think I mentioned that the kindergarten classroom next door also has a pond with the same nursery rhyme tiles and a turtle fountain. Unfortunately, poor tuttle lost his head many years ago. It would be wonderful to restore it, so I’m going to begin with American Olean and see if they want to “sponsor” a restoration of the turtle fountain and a couple cracked tiles. All photos courtesy Mark Kirsch. “The building at 69062 Benham Beach Rd. in Sturgis, Michigan is indeed our home. The house was built in the mid -’20s by my great grandfather C.W. Kirsch, who was the founder of Kirsch Window Treatments. It is located on a hill overlooking both Klinger Lake and the golf course. 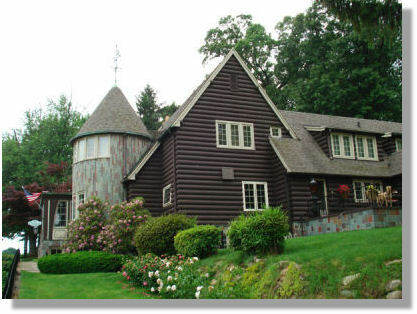 The materials used on the exterior were slate, redwood logs and copper. We have not been able to determine the architect. Trenton, New Jersey, circa mid-1920s. “After my grandparents passed, the home became a guest house for company executives and traveling salesmen. Many famous celebrities have stayed here like: Vincent Price and Bob Crosby - Bing's brother. The company was sold to Cooper Industries in the ‘80s, which maintained the house as the Kirsch Company had. A few years later, Newell Rubbermaid bought the company and then sold the house to a retired judge and his wife. Unfortunately, the judge died suddenly in a car crash and the wife could not live in the house alone. When she put the house on the market, we were notified by the area's real estate agent. After many discussions with my wife, we decided to sell our home in Scottsdale, AZ and relocate back to Sturgis, Michigan where I grew up. 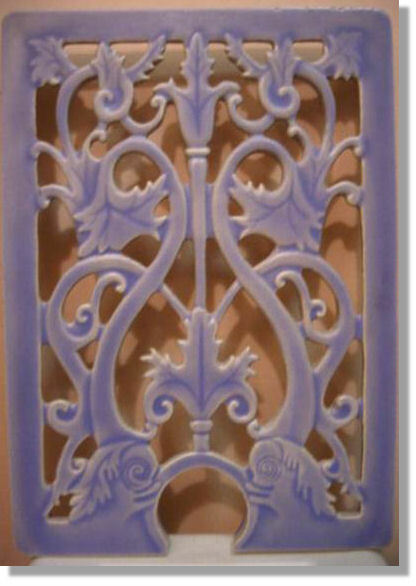 3x3 Flint Faience decorative insert. Detail of the Mueller Mosaic fireplace mantel. All of the tiles on the upstairs interior were produced at Mueller Mosaic Co. in Trenton, New Jersey (1908-1942): the floors, stair treads and risers, fireplace mantel, corbels, ship mural, in fact all of the decoratives EXCEPT the 3x3 decorative inserts, which were made by Flint Faience and Tile Company in Flint (1921-1933). Likewise, the stairs leading to the basement as well as the basement floor are likely to be Flint as the decorative inserts in this floor are Flint. are Flint Faience from Flint, Michigan. The basement was used as a temporary club house for the private country club next door that had burned down—until it had been rebuilt. The garage was large, but not enough to fit CW's Duisenburg, so a notch was cut out of one end of the garage in order to keep the "Doozie" inside. 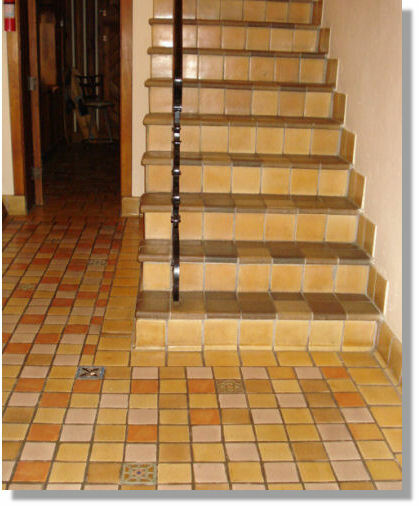 The stair risers and floor tiles are Flint. 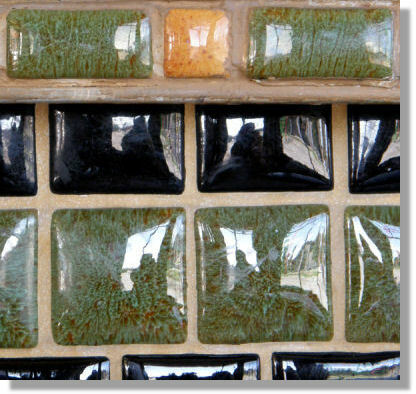 The Mueller Mosaic tiles are featured in the more expensive of the two Mueller catalogs you'll find at http://www.tileheritage.org/THF Catalogs-Page 1.html. 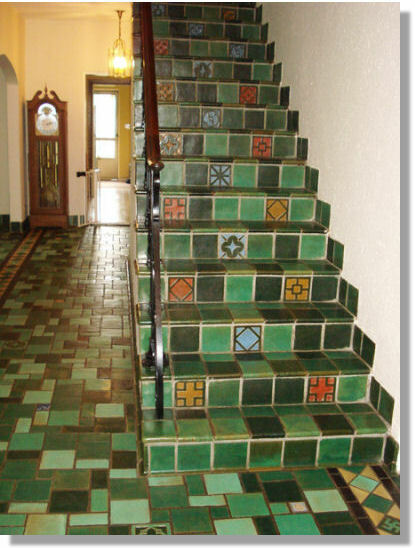 Flint Faience has its own book, Flint Faience Tiles A to Z by Margaret Carney & Ken Galvas, which is another option for you, or you might consider Norman Karlson's American Art Tile 1876-1941, which has sections on both Mueller and Flint. 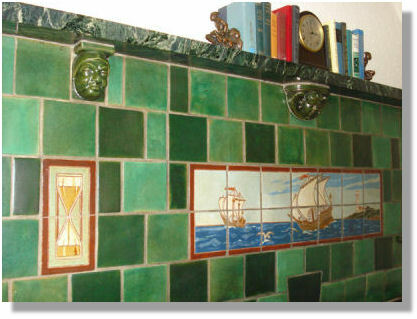 The Tile Heritage book collection can be found at http://www.tileheritage.org/THF-Book List.html. This is truly a gorgeous home. 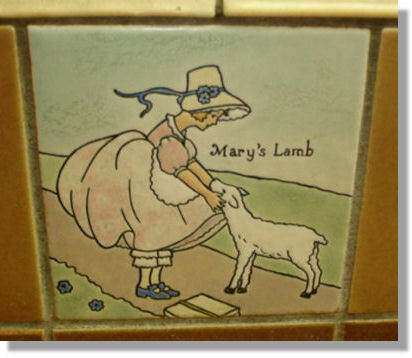 The tiles are incredibly well maintained, which we greatly appreciate. Lou Starr of Springville, New York wrote: “I thought you might be interested in seeing pictures of a theatre lobby light I purchased a number of years ago and which is now inset into my bathroom wall for use as a night light. The outer size is 18" x 13 1/2", and the wiring and switch are original to the piece. It is marked American Encaustic Tiling Company on the back of the main body. about twice the height of these light bulbs. In fact, what Mr. Starr uses as a light was originally designed as an electric heater! 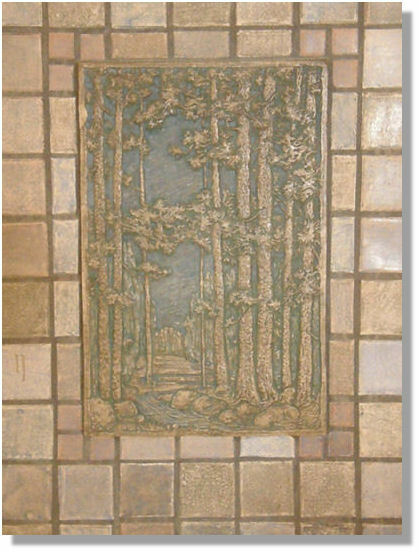 A smaller one, 12” x 12”, is illustrated in an American Encaustic catalog, “AETCOTYPE” Accessories, published in 1925 (available for sale at http://www.tileheritage.org/THF Catalogs-Page 1.html). According to the description in the catalog, the heater is provided with openings for three sockets. 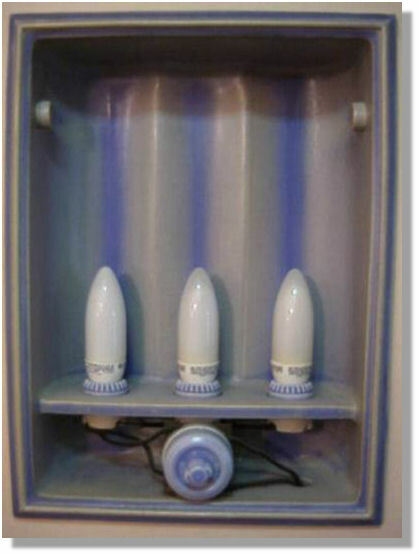 The heating elements are attached at the base of the fixture, permitting the heat to radiate without injury to the sockets. Indeed, during the winter months these heaters would be quite desirable in residential or public restrooms in or around Olean, New York! 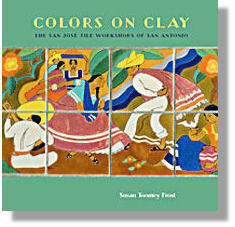 Susan Toomey Frost, author, tile and pottery collector, educator, and longtime member of Tile Heritage, has thoroughly covered all the bases with her new book, Colors on Clay: The San Jose Tile Workshops of San Antonio. Within these 256 illustrated pages she succeeds in unraveling the controversies that have surrounded the handcrafted tile production in this Texas community while at the same time celebrating the artists, major and minor players alike, who have produced this distinctively romantic, regional ware. 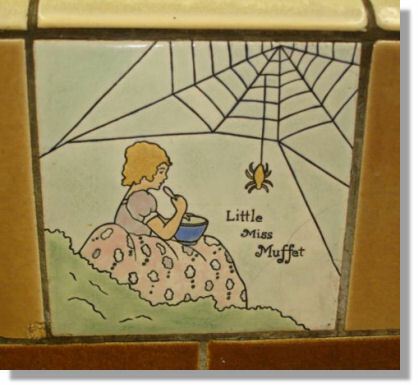 Supporting the story that covers roughly 50 years of production are over 300 illustrations of tiles and related clay objects, many of the images accompanied by original drawings, hand-drawn cartoons of the tile designs. The layout throughout the book is particularly appealing as there is amble space that allows the imagery to speak for itself without being burdened by surrounding text; and the background colors of the printed pages throughout tend to effectively augment the tile pictures. The book is not without an exhaustive list of sources as well as a helpful index. Since the publication of Ceramic Art of the Malibu Potteries in 1988 there have been a number of books published featuring American decorative tiles. Because of the depth of research, the delightful romanticism reflected in the imagery, and the overall beauty of the publication itself, Colors on Clay is among the most inspiring treatises in celebrating the tile production within a particular community. 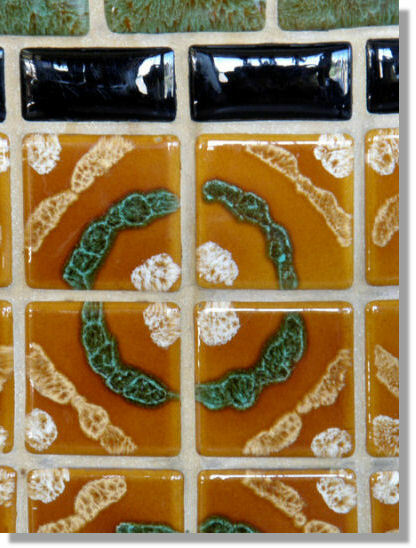 Colors on Clay is available from Tile Heritage for $45 (member discounts apply). Fill out the Book Order Form at http://www.tileheritage.org/pdfs/THF-BookOrderForm_printable.pdf, be sure to add your local sales tax if ordered from California, plus $7 to cover shipping and handling.